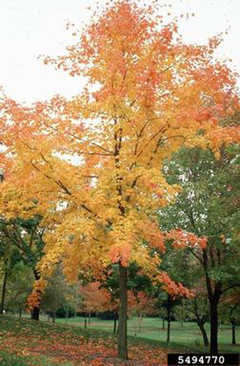 This Tree in Colorado: The Sugar Maple is one of the best shade and lawn trees for larger areas. It has a pleasing growth habit and beautiful fall color. 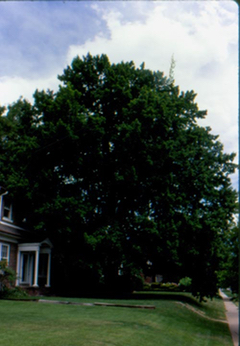 Landscape Use: This tree commonly grows up to around 75′ high, but has been known to occasionally grow as tall as 120′. The spread usually equals about two-thirds of the tree’s height. Likes ample space; does not thrive in crowded or polluted conditions. Hardiness: Usually zones 4-8; some cultivars are heat tolerant up to zones 7-8. 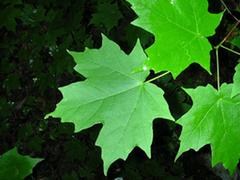 Leaves: 3-5 lobed leaves are medium to dark green in summer and can turn a variety of colors in fall, from brilliant yellow to burnt orange to red depending on the tree. Flowers: Subtle flowers are greenish yellow. Bark: Smooth and grey-brown in youth; deeply furrowed with irregular thick plates or ridges with age. Insects and Disease: While this tree is generally healthy, excessive drought conditions can make it susceptible to leaf scorch and Verticillium wilt.